Artist Relations Interviews Phil Antoniades from Nimbit! Nimbit’s Carl Jacobson takes us on a step-by-step stroll down Nimbit Avenue, explaining everything there is to see and do along the way. You can publish a song, or even an entire project, to a Facebook store via Nimbit’s integration into Studio One. These first two vids explore Nimbit setup and your first upload/publication. Jump in! Nimbit is already blowing minds, and it’s only going to get better from here! It was my first time ever at summer NAMM. Walking around, seeing all the different booths filled with guitars, recording equipment, microphones, and everything else a musician could think of was getting me so excited I could hardly stand it. Not long after being amongst the amazingness, I came across a booth that instantly grabbed my attention. Now, I had heard of the company PreSonus before, but never had a chance to check out their equipment, and MAN was I impressed! After being shown the incredible soundboards they had at their booth, I noticed the stage and the iPhones setup with QMix that they had attached to headphones out in front. I asked Rick Naqvi if they would let me perform and test out their live recording, and he was kind enough to let me do a couple songs! While I performed, PreSonus demonstrated StudioLive Remote live mixing and I was blown away! The software they produce is so incredible, user friendly, and quick! I was in amazement at how simple it was to get a great live recording mixed and ready to post on your Nimbit account… Which leads to my next point.. The awesome world of Nimbit. This site was brand new to me, but instantly upon getting the grand web tour, I was hooked. This site is basically everything an artist needs for music and merch sales all rolled into one! It’s so easy to set up an account, and post your songs and merchandising online. I have it linked up directly to my Facebook as well, which is INCREDIBLY convenient. All my fans can access my Nimbit store right on my Facebook page! One thing with this site that stands out to me and sets it heads above the rest is the different promotional offers this site has built in. As an artist, you want to keep in contact with your fans via e-newsletter, to keep them updated with what’s going on; and as a consumer, it certainly is cool to get free stuff! So Nimbit has an option that allows anyone who signs up with their e-mail to get a free song download! It’s a really cool way to share my music, and to basically give my fans something back for supporting me. It’s fabulous. All in all, I have had such a wonderful experience since I have been working with PreSonus and Nimbit. Any touring artist absolutely should NOT be without either of these fabulous musical amenities. Both PreSonus and Nimbit have bumped my music career up to the next notch, and have made promoting my music so much easier. So glad to have come across the PreSonus booth at NAMM. Premier Guitar Interviews Phil Antoniades from Nimbit! Hey! We’ve got a new video on our hands, hot on the presses from Summer NAMM! Rebecca Dirks of Premier Guitar came by with a camera guy and collared Nimbit’s Phil Antoniades, and grilled him about PreSonus’ recent acquisition of Nimbit… and what it means for Studio One users. Turns out it means quite a lot. Thanks to Rebecca and PG for the hype! Sonic State Interviews Rick Naqvi on Nimbit! Our VP of Sales and all-around Alpha Bro-Dog Rick Naqvi took some time out of his incredibly busy schedule to be subjected to the interview stylings of SonicState‘s Nick Batt. Agenda items on the docket included “You guys are on fire,” “Sometimes Skype is hard,” and, of course, “Nimbit!” Rick’s the first of three interviews, so jump on in! PreSonus™ announced it has acquired Nimbit® and integrated its technology and services into Studio One™ Artist, Producer, and Professional to provide a complete solution for music and audio creation, sales, and promotion. The integration will be available on August 1, 2012, via a free Nimbit Extension for Studio One 2.0.6 and later. Instantly sell and promote their music and audio the moment it is created. Sell MP3s, CDs, merchandise, and event tickets through beautiful stores for their Facebook pages, their Web sites, NimbitMusic.com, and services like Jango, FanBridge, and PledgeMusic. Create sharable, interactive promotions for Facebook, Twitter, and email that feature music and video players, messages to fans, and free downloads to drive sales. Grow their fan base and understand their fans better thanks to detailed analytics and sales reporting. From Studio One Artist, Producer, and Professional v.2.0.6 and later (with the free Nimbit Extension), you can select an individual song right from the start page, or select File >Export and upload to Nimbit. You then add details, upload a product image, and set a price, and your music will be immediately available for sale. 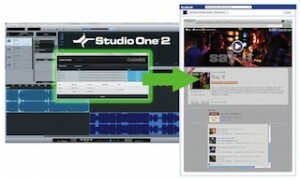 Studio One Professional users will reap additional benefits. When you export to Nimbit from the Project page, your project metadata pre-populates the Nimbit product setup, allowing you to sell and promote your music almost instantaneously. With the addition of Nimbit technology and services, Studio One users can now go from creating the first track to marketing and selling a finished project, all within Studio One and associated Web sites. Studio One Professional users can record, mix, master, digitally release, burn CDs, upload to the Web via SoundCloud, and market and sell through Nimbit without leaving the DAW. In short, Studio One has become a complete musician’s solution. Registered Studio One 2 customers will be able to download the Nimbit Extension free from the PreSonus Exchange. Having installed the Extension, they can sign up for a Nimbit Free or Nimbit Plus account from within Studio One and start selling and promoting their music. The benefits of Nimbit are not limited to PreSonus Studio One customers. Anyone who would like to sell and promote their music, other audio products, and merchandise can sign up atwww.nimbit.com or can install the free Nimbit store for Facebook. To accomplish this integration and take full advantage of the two companies’ synergies, 2012 PreSonus acquired Nimbit, Inc., in April 2012 for an undisclosed sum. Nimbit will continue independent operations as a wholly owned subsidiary of PreSonus, located in Massachusetts. Nimbit founders Patrick Faucher and Philip Antoniades and CEO Bob Cramer will continue running day-to-day operations, product specification, and development of the Nimbit platform; and Nimbit’s development, support, retail, and marketing teams are all remaining with the subsidiary. Nimbit®, a PreSonus™ company, announced the availability of the new NimbitPlus™premium subscription plan, which offers extended sales, customization, and promotion capabilities. In addition, the company has also announced a major update to the Nimbit Promotion Tool and the ability for NimbitFree and NimbitPlus users to sell on Jango Internet Radio. Since the introduction of NimbitFree in 2011, Nimbit users have demanded a more powerful solution that takes advantage of the streamlined user interface and ease of use found in the new platform. To address these needs, NimbitPlus is now available, for a low monthly subscription fee of only $9.95 U.S.
For a detailed comparison of NimbitFree and NimbitPlus, click here. Earlier in 2012, Nimbit streamlined the process of driving fans to artist storefronts with sharable, interactive promotions on the Facebook Timeline, Ticker, and Wall that featured “in-post” music and video players, messages to fans, and direct links to rewards such as free downloads. The Nimbit Promo Tool has been expanded to allow promotional campaigns to fans on Twitter, via email, and through short text promo codes that can be used in advertisements, print, and live appearances. When fans click the promotional links or enter the promo code on the Nimbit store, the artist’s store loads with a welcome screen that includes a link to a free download, a player to preview the song, a video of the song or a personal message, and the option to shop more. The Nimbit Promo Tool is available in both NimbitFree and NimbitPlus. NimbitFree customers are limited to only one active promotion at a time. Artists can now capitalize on the exposure they get through airplay to the millions of fans on Jango Internet radio with the new Nimbit Store for Jango. When a fan discovers you on Jango and clicks through to your profile page, a Nimbit store will load that allows you to sell music, merchandise, and e-tickets; capture fans with free downloads; and gain additional support with an in-cart Tip Jar. The Nimbit Store for Jango is free, and Jango artists can sign up for Nimbit right from their Jango dashboard. In addition, Nimbit artists can sign up for free Jango airplay and activate their Jango store from their Nimbit dashboard. Nimbit is a subsidiary of PreSonus™ Audio Electronics, Inc.
For more information, please visit www.nimbit.com.